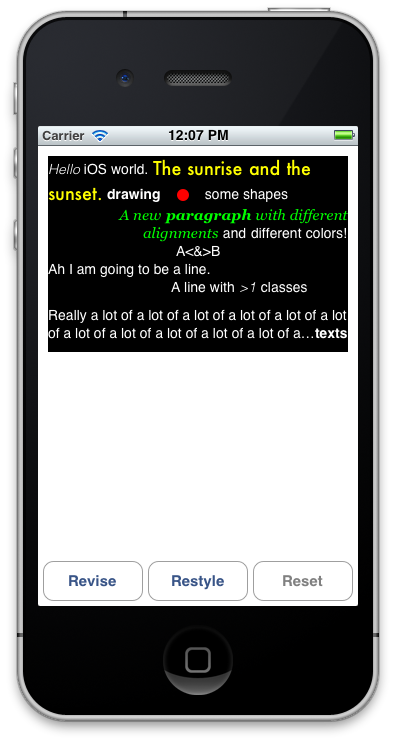 GSFancyText is a rich text drawing library for iOS. The open the GSFancyTextDemo.xcodeproj file with Xcode and run the app. For a better viewing experience, it's recommended to compile it to an iPhone, iPod touch, or iPhone simulator. You can check the GSFancyTextDemoViewController.m file under the demo folder to see how the fancy text is defined. You can also change the parameters and see how it affects the output. Install Doxygen, run ruby docs/create.rb to generate a docset file. After installing docset, you can hold the option key and click a GSFancyText class or method name in Xcode, to preview or link to the documentation page. A major portion of GSMarkupNode, GSFancyText, GSHTML, GSParsingHelper, GSHierarchicalScan are covered by unit tests. Methods involving drawing, view displaying, and view frame updating are not covered.